It seems like the artichoke was designed for stuffing. That huge cavity in the middle surrounded by all those layered leaves make it a perfect receptacle for all sort of savories. No wonder there is an almost endless variety of stuffed artichoke recipes. 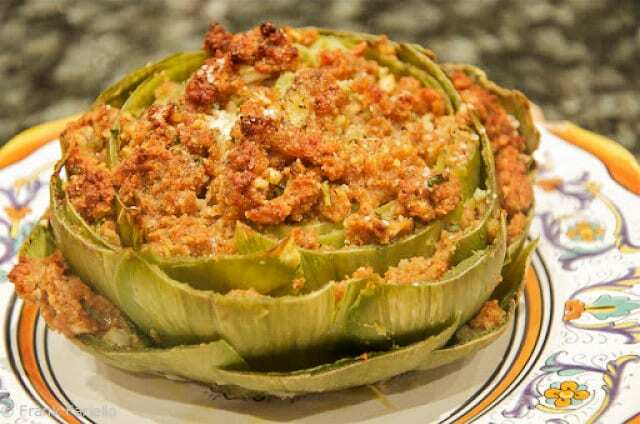 Here is the way that Angelina made her stuffed artichokes: as always, her recipe was as straightforward as they come, with a simple stuffing of bread crumbs, garlic, grated cheese and parsley, bound with a bit of egg. The artichoke is boiled, stuffed and then baked until golden brown on top. It’s a technique that really lets the flavor of the artichoke itself shine through. Trim off the stem of the artichoke so it can ‘sit’ without rolling over. Then tear off the toughest outer leaves, but leave most of the leaves on. Cut off the top 2-3 cm (1 inch) of the tip of the artichoke and, using a pair of scissors, trim off the pointed tips of the remaining outer leaves. Bang the artichoke against a hard surface and use your hands to loosen the leaves a bit. As you work, rub the artichoke with the cut end of half a lemon. After you treat each artichoke this way, place it in a bowl of water that you will have acidulated with the other half of the lemon. When the artichokes are done, fish them out of the pot with a slotted spoon and let them cool off a bit, placed upside down so they can drain well. Then, using a paring knife or spoon, dig out the ‘choke’ (the collection of fibers and inedible small leaves at the core of the vegetable) to create a cavity to hold the stuffing. Pour over a small glassful of water or white wine. Drizzle them with a generous amount of olive oil, season them with salt and pepper, and place them in a preheated oven (200C/400F). Let them bake for about about 30 minutes, or until they are nicely browned on top. Baste them from time to time during as they bake with the cooking juices in the bottom of the baking dish. Remove and let them cool, serve warm or at room temperature. There are also different ways to stuff the artichoke. Especially if you are using smaller artichokes, you can dispense with trying to get any stuffing between the leaves and just stuff the center. 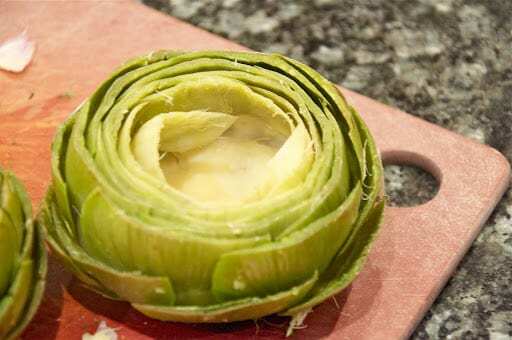 In some recipes, you slice the artichoke down the center and top up the exposed center with the stuffing. In these variations, you often trim the artichoke in the more usual Italian way, removing all the tough outer leaves, leaving only the edible bits (see this post for basic instructions). Stuffed artichokes make a great antipasto, but they are substantial enough—especially if you enrich the stuffing—to serve as a nice vegetarian secondo or even a piatto unico for a light supper. Don’t serve them straight out of the oven; they delicate flavors are best enjoyed either warm or at room temperature. Trim off the stem of the artichoke so it can 'sit' without rolling over. Then tear off the toughest outer leaves, but leave most of the leaves on. Cut off the top 2-3 cm (1 inch) of the tip of the artichoke and, using a pair of scissors, trim off the pointed tips of the remaining outer leaves. Bang the artichoke against a hard surface and use your hands to loosen the leaves a bit. As you work, rub the artichoke with the cut end of half a lemon. After you treat each artichoke this way, place it in a bowl of water that you will have acidulated with the other half of the lemon. When the artichokes are done, fish them out of the pot with a slotted spoon and let them cool off a bit, placed upside down so they can drain well. Then, using a paring knife or spoon, dig out the 'choke' (the collection of fibers and inedible small leaves at the core of the vegetable) to create a cavity to hold the stuffing. Using a spoon (or your hands!) stuff the center of the artichoke and the spaces between the leaves as well. The artichoke looks amazing! I make something very similar except it has a tiny bit of cooked Italian sausage in the stuffing. I am going to gorge myself on artichokes when we arrive in Rome! This looks wonderful and delicious! It reminds me of the ones my mother made. Thanks for sharing! Thanks for inspiring to post an artichoke recipe today that I linked back to this post. I had never cooked large artichokes like these before and the timing of your post couldn't have been better. I am always eyeballing artichokes at the market, but I never get them … what a shame eh? I love this simple method and all of your useful tips. My mother always made carciofi alla giudia and I craved for stuffed ones, but could only eat them if someone else prepared them. Yours look very nice! I don't need anything else on the menu when these beauties are served. This looks so good. Just bought 4 organic artichokes yesterday and was looking for a good recipe. Will definitely be giving this one a try. Thanks for sharing! Do try it, Tiffany! It's really very easy to do! Thanks for the kind words, Drick! Definitely worth another try! This is such a winner! Love this for summer entertaining. Always enjoy a visit with you. It was National Artichoke Day on Saturday, apparently. Perhaps that explains it? Or just the fact that artichokes are in season. I never pay attention to fake holidays! Frank – This is the second stuffed artichoke post I've read in two days that features baking in the oven, vs. cooking on the stovetop (my method). I have to say this really intrigues me since the bread has a chance to form a brown crust. I'm trying the oven method next – they look too delicious and tempting. The stuffing you used is identical to the one my mother-in-law used to make – It's delicious and it does indeed let the artichoke shine.